While walking through campus or a street full of stores, you might have heard “Headphone Sseo,” sung by Twice, a popular girl band in Korea. Did you know one of the music producers of this song is now attending the University of Seoul (UOS)? Seung-hwan Kim, a student in the Department of Urban Planning and Design, helped write this popular song. The UOS Times will examine the life of a music producer, and how he or she manages projects to create music from his or her own unique vision and perspective. Kim’s interest in making music has continued since his years in high school. When Kim was a freshman, he made a songwriting club where he gave performances in front of audiences, made albums, and even outsourced songs made by himself and the other club members. During his second-year of school he decided to become a music producer. In his free time, he started making music to get a break from his studies. 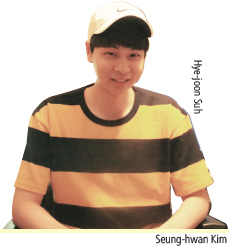 While composing songs, he was so absorbed that he lost track of time. Only then, working far beyond the curfew at his boarding school, did he realize what he loved most: making music. Kim was sure that becoming a music producer would make him happy. People choose music according to their tastes and often listen whenever they feel down or stressed out. However, the whole process to create one song is not simple. Starting from composition, there are procedures such as operating funds, employing staff, singing, recording, mixing, mastering, making videos, and distributing the results. Gradually, the field in which music producers engage has broadened, and today they direct most of these procedures. Within the particular theme of an album that a music producer has developed, their main job is figuring out the appealing points of the artist and maximizing them. To create one album, lots of professionals in various fields are needed to release an album. It is much more work than most people understand. When Kim writes a song, his first step is playing chords on a keyboard while making melodies and lyrics. Then, he organizes the rhythm and synthesizes music with a Musical Instrument Digital Interface (MIDI) program. These processes are called “sketching,” which takes about three hours. 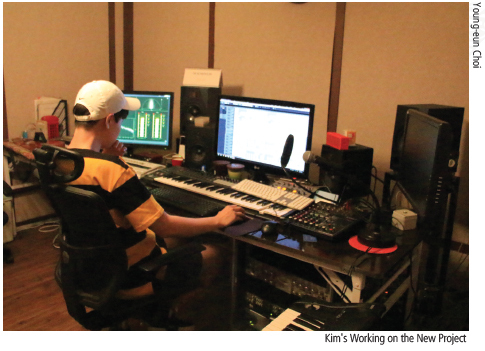 If his client is satisfied with this work, Kim starts arranging the song. The work goes through dozens of changes until the song is completed. When Kim first started his work, his colleagues considered him a cool-headed person because of his firmly analytic and organized methods. This was how he got his stage name, “Tunedra,” which is a combination of the words “tune” and “tundra,” a region where tree growth is impeded by low temperatures. It seemed this was how he could build his career and attend school at the same time, by working or studying in a systematic way. However, while majoring in the Department of Urban Planning and Design, Kim did not have considerable opportunities to learn music theory in class like students majoring in applied music. Accordingly, he developed another way to build his career by listening to a large amount of music for about five hours a day. He did this to learn to notice musical trends quickly and easily. So how does Kim manage his daily schedule? 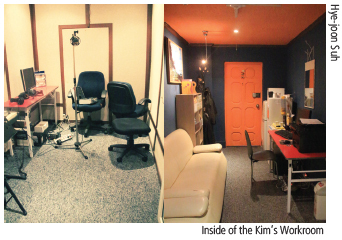 He told us, “I always run out of time.” Kim’s studio is located in Hongdae, and he commutes between UOS and his home in Sanbon. He spends about a quarter of his day in the subway. However, Kim never wastes this time. He transforms the subway into his personal workspace where he comes up with melodies and writes lyrics. Kim never wastes time because he wants to be successful in his musical career. “My goal as a music producer is making music that keeps pace with popular trends, which inspires many people by satisfying their preferences.” He said, “I think a music producer can deeply move people’s hearts by sharing songs that evoke the sympathy of audiences, thus inspiring them.” Kim also said that it is a prerequisite to have a lot of experiences to share ideas with people. This was why he did not quit university; so he could understand the feelings of students. 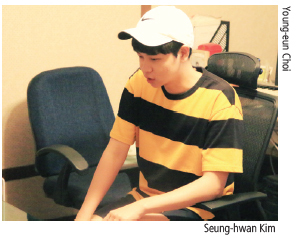 It was very interesting to spend time interviewing Kim because I learned about the various tasks in music producing. Also, a music producer’s fundamental job is creating a social consensus with audiences by making music that satisfies their preferences, and this goes through unseen endeavors like spending time listening to new music for a long time every day, in order to follow current trends. I hope you can experience his music soon.